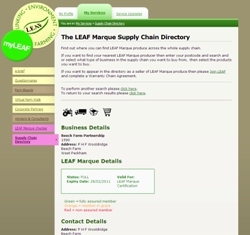 The directory contains full contact information for all LEAF Marque producers, packers, processors, distributors and retailers who are members of LEAF and lists the products they produce and sell, are certified for, and gives their LEAF Marque certification status for producers. The supply chain directory and other industry services are available to genuine buyers and sellers who are committed to buying food grown with care to the environment that is LEAF Marque certified. The supply chain directory gives the opportunity for buyers to purchase LEAF Marque certified product and promote this to their customers whether consumers or other businesses in the food supply chain they operate in. LEAF Marque produce is the real ethical choice for those who believe that sustainable food should be affordable to all. The supply chain directory will enable you to source direct from the producer and ensure that you are getting the real thing. 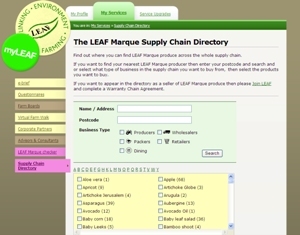 The LEAF Marque Industry area includes the LEAF Marque member checker for verifying the status of LEAF Marque assured producers.